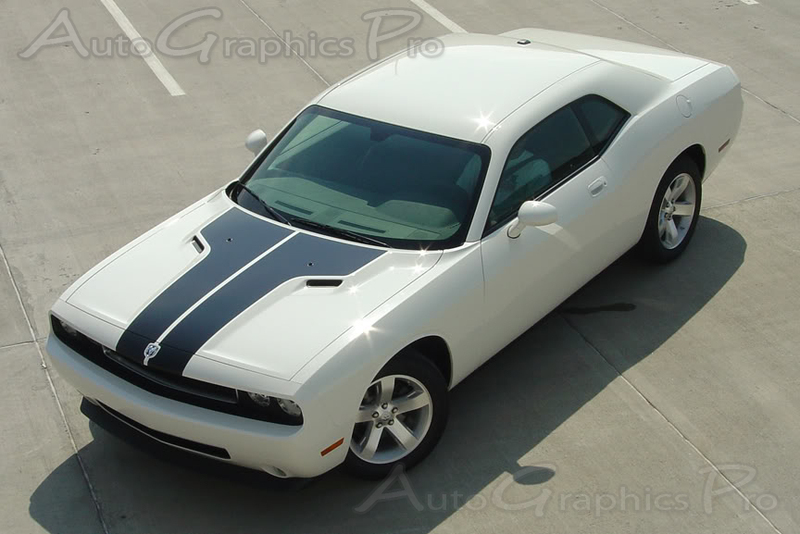 The Challenger HOOD vinyl stripes kit for the all new 2008 2009 2010 2011 2012 2013 2014 Dodge Challenger is a hood racing stripe "T" style graphic that is a needed upgrade that breaks up the distinctive body lines of this remarkable Dodge model, capturing an aggressive style with remarkable muscle car feel. Add an improved look with an easy to install vinyl graphic accessory package for an amazing transformation for your new car! The HOOD vinyl kit includes driver and passenger hood graphics as shown, ready to install and arranged in a way for easy installation! While matching the specs of the factory kit, the T-HOOD vinyl decals will cover the front fascia near the center of the nose of the Challenger, with sections included for Challengers with front emblem and without front emblem. 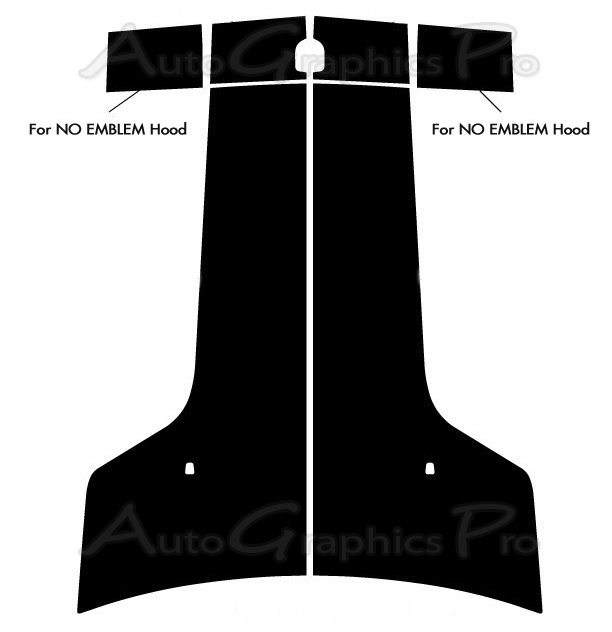 Then the graphic goes across the hood back towards the windshield and will branch out to a T shape on the raised section of the hood behind the hood intake vents. This is a very popular style reminiscent of the 1970ï¿½s version. 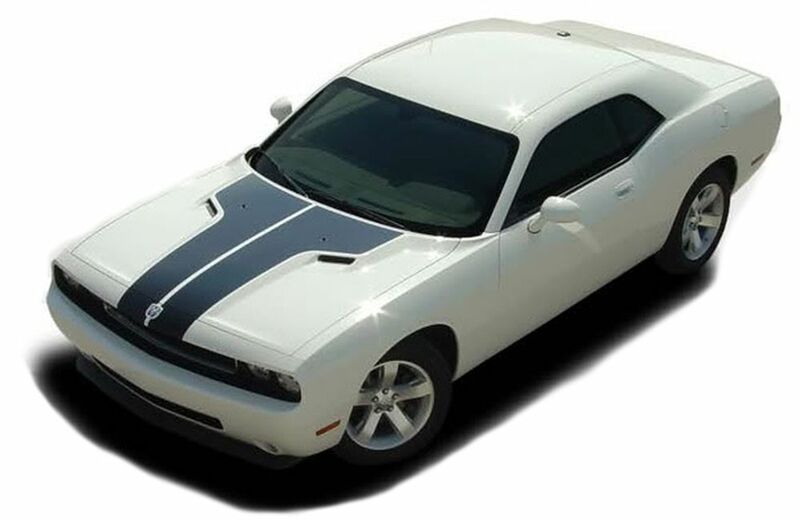 The new Dodge Challenger is a fine addition to this generation of modern V8 muscle cars, and these vinyl stripes will add a needed customization for a more factory look without the OEM price! 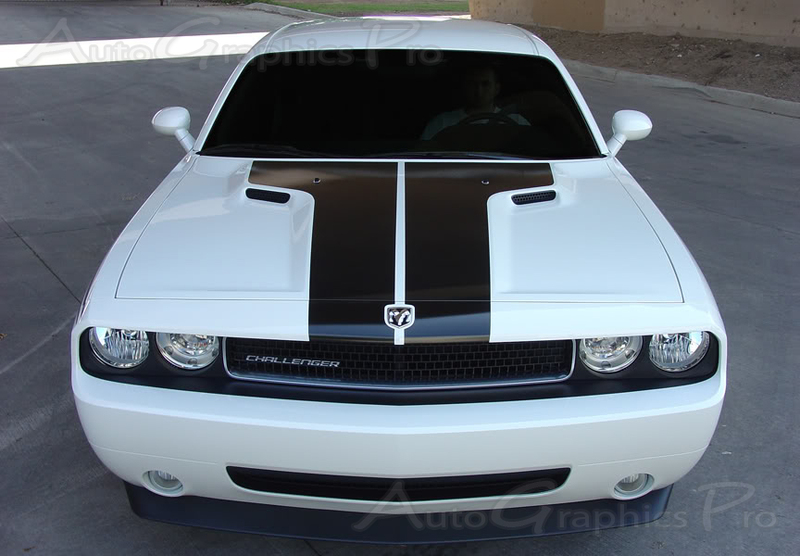 This Dodge Challenger HOOD vinyl graphics kit is pre-cut and designed to fit the body style and model indicated above, and is manufactured using 3M High Performance vinyl, and available in many vinyl color styles. This design fits the Dodge Challenger Models. 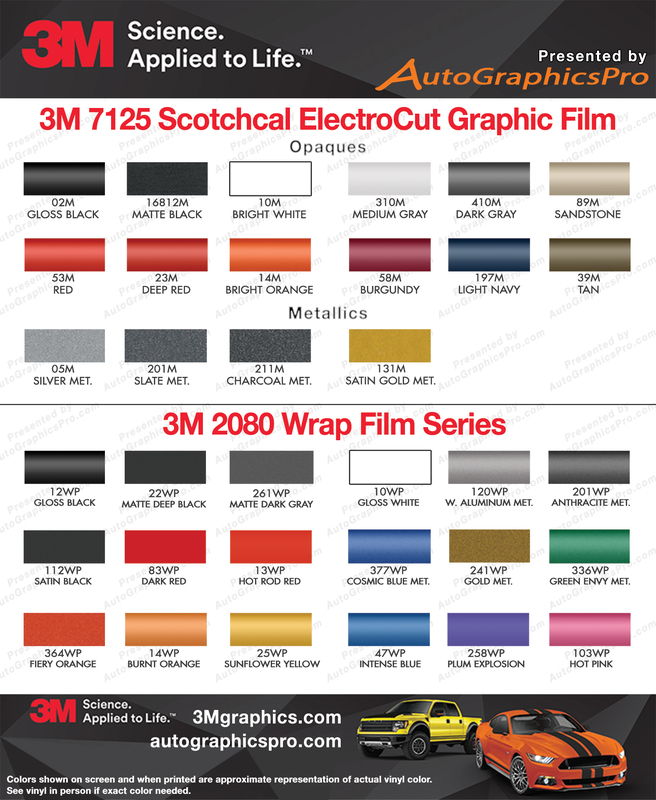 This multi-section vinyl graphics kit is designed specifically for the Challenger body lines, and is made of 2 mil (50 micron) 3M High Performance Vinyl Film with each piece pre-cut to fit and requires little to no cutting on the vehicle. It offers an subtle styling that captures a custom look with modern vinyl materials! This vinyl graphics package comes in any of the 3M High Performance professional vinyl colors listed. We use only "cast" vinyl film from 3M, not the cheap "calendered" vinyl, so you can expect years of enjoyment from this custom graphic! Completely changed the looks of the car. Follow the directions to the letter and you will have great results! Take your time and be patient!